If you have a sizeable disposable that you want to splurge on your furry best friend- then an ‘I Love Dogs Diamonds’ has the perfect collar for your little pooch from the I Love Dogs La Collection de Bijouz Amour! Make your dog feel special by purchasing it the Amour collar worth $3.2 million and make him feel like a million bucks by buying him the most costly dog collar in the world. 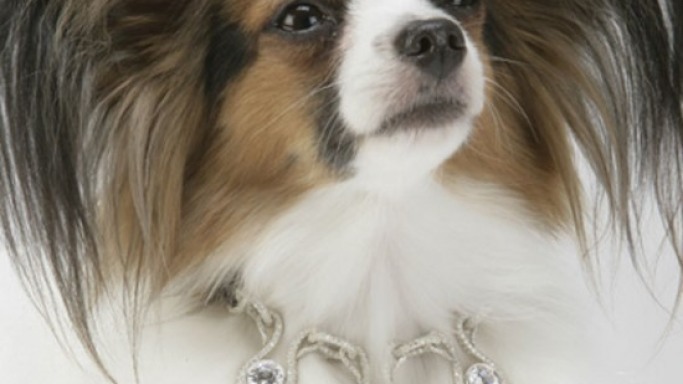 This 52-carat diamond encrusted dog collar has a centerpiece that measures to 7-carats and is set in an 18-karat white-gold and platinum setting. The area in which this luxurious collar does not comprise of priceless stones is made up by exotic and expensive crocodile leather which adds to its durability and comfort quotient. The collar is indeed a masterpiece with an exquisite necklace-like chandelier designs formed out of 1600 diamonds features three tiers of diamonds. Amour has indeed been titled ‘the Bugatti of dog collars’ by Matt Miller, Forbes Senior Editor However, if you cannot stretch your budget to buy the most expensive dog collar, ‘I Love Dogs Diamonds’ has a range of other priceless collars between $280,000- $900,000. There is the ‘Amour de la Mer’ (love of the sea) which is a dog collar that has an 8.5 carat sapphire pendant in the center along with 600 diamonds that are set in an ostrich leather band which is prices at $899,000. Then there is the ‘L’Etoile’ which is a stellar collar that has five luminous diamonds that are set in an ostrich leather band along with 400 other diamonds that are hand set. This opulent collar is priced at $518,000. The entire range by ‘I Love Dogs Diamonds’ can be customized to order which takes nearly 8-12 weeks to complete and comes along with a GIA certificate of authenticity. Nevertheless, if you still have your heart set on the ultra-expensive ‘Amour’ and you believe in Easy Monthly Installments, then you could still go in for the most expensive dog collar and by paying three installments! Rich owners of dogs will now be able to redefine ‘canine luxury’ to a new level altogether ever since ‘pooch hotels’ became the benchmark of canine luxury. In fact, a lot of dogs are having priceless collars around their furry little necks and the La Collection de Bijoux has been getting a lot of demand for them which just demonstrates how trendy they have become. The only downturn in such staggeringly expensive dog collars is the threat that is invariably posed to these pooches in the form of ‘dog-nappers’!